FRASIER FIR FRAGRANCE - The aromatic snap of Siberian Fir needles, heartening cedarwood and earthy sandalwood combine to create a just-cut forest fragrance that evokes warmth and comfort. SCENT FOR ALL SEASONS - Get in the holiday spirit all year long with the fragrant mountain fresh pine scent of Frasier Fir. 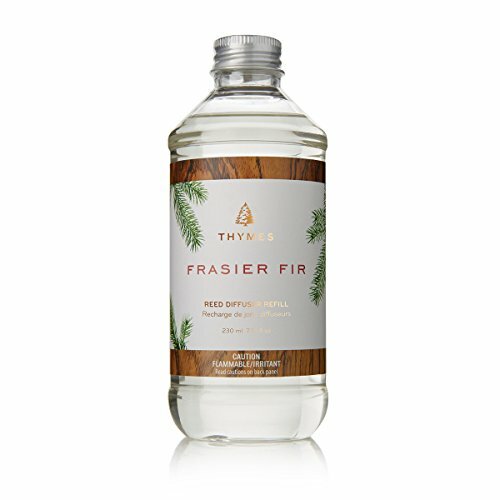 SET THE MOOD FOR MEMORIES - Thymes' Frasier Fir scent sets the mood for holiday memories, inviting the classic pine scent into your home. CONVENIENT REFILL - Refresh your Frasier Fir Reed Diffuser with this convenient oil refill. THYMES FRAGRANCES - Thymes fragrances are composed in our on-site fragrance studio, where our chemists and perfumers blend nature, art and science to create outstanding products.